If your wallet is having trouble claiming your EOS balance, then this might be an option for you. This process is quite rare, and it's unlikely you will need to use this reset feature. 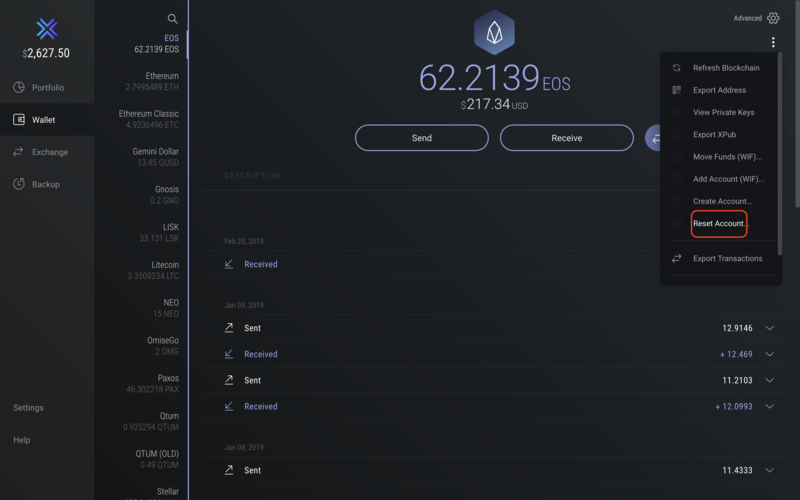 If you are one of the rare cases where Exodus didn't manage to claim your account properly, or there has been a change in the EOS Public and Private Key permissions, then you might need to use this option to give Exodus a fresh start. In that case, all you have to do is click on the three dots in the upper righthand corner to access the asset option menu. Then click on Reset Account. Exodus will try again the claim process, attempting first to claim addresses that were registered normally, then those eligible for fallback (using your ETH Private Key) and finally addresses that weren't registered and aren't eligible for fallback. If your Public Key has been disassociated from your account, Exodus will "forget" it and show an empty wallet.